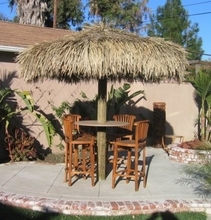 Description of Mexican Palapa Thatched Umbrella Cover: Converts most heavy duty wooden framed umbrella into a tropical tiki umbrella with its shaggy thatch exterior and woven knotted interior. Not recommended for market umbrellas with canvas. Palapa Covers can be ordered pre-fire retarded for interior or exterior for a extra cost and comes with a fire certificate. See fire retardant palapa covers under this category. 7 ft x 1" thick. Designed to go on 6' - 6.5' diameter umbrella frames so that you will have overhang around the edges. Will fit 7' umbrella frames with little overhang. How long can I expect Mexican Rain Cape Umbrella Cape to last? Mexican Rain Cape will last 5-6 years outside in dryer climates and indefinitely inside. Not like other companies that sell a similar product.